Student success has long been a pillar of UMBC’s mission as a public research university, and the Baltimore Sun‘s latest special section on education highlights multiple UMBC programs focused on enhancing student achievement and experiences in and out of the classroom. 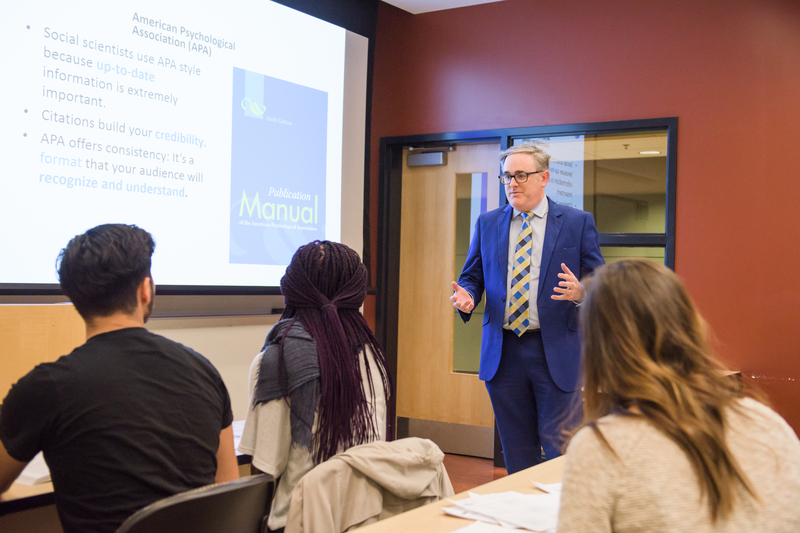 UMBC’s master’s program in industrial/organizational (I/O) psychology offers its students an opportunity to take a refresher course in the American Psychological Association (APA) technical-style writing. Elliot Lasson, professor of the practice and I/O program director, worked with the Center for Academic Success to establish a summer workshop in APA writing after he learned from faculty that a number of students would benefit from extra training in that important skillset. Elliot Lasson teaches students about the APA style. Photo by Marlayna Demond. Lasson explained that its essential for psychology students to develop this skill to have continued success as they advance in their careers. The RX5 program, developed by the UMBC Training Centers and Bowie State University, simultaneously addresses the shortage of talented professionals in the cybersecurity industry and the need to improve career opportunities for military veterans and diverse populations. Participants in the RX5 program complete 18 weeks of cybersecurity training, plus a 12-week fellowship, to prepare for a new cybersecurity career. The program provides students with “a pathway to getting hired,” Mason explained. UMBC’s College JUMP program provides near-peer college access mentoring for refugee youth in Baltimore City and Baltimore County. Current UMBC students are paired with refugee high school students through The Shriver Center to provide resources, support, and guidance throughout the college application process. Christina Smith ’15, global studies, serves as the coordinator for the program as UMBC’s Maryland-DC Campus Compact (MDCCC) AmeriCorps VISTA. She said mentors meet with students on a weekly basis to navigate the college application process. A group of mentors, students, and a Chesapeake Hall resident pose at the College JUMP kickoff event. Photo by Brittany DeNovellis. Nuam Lun, a high school senior in Baltimore who grew up in Myanmar, is participating in the College JUMP program after learning about it from a friend. At first, she found the college application process to be daunting, but she said the program has helped by providing her with useful resources. “It was tough at first as a refugee. My English skills have improved. I know how to write better, speak better and how to listen better. I’ve applied to six colleges and for scholarships,” she said. Read the full education section in The Baltimore Sun. Header image: UMBC I/O Psychology Professor Elliot Lasson reviews the basics of APA writing style with students Wilson Merida, Faith Kamei, and Wendy Lopez. From L-R: Wilson Merida, Elliot D. Lasson, Ph.D., Faith Kamei, and Wendy Lopez. Photo by Marlayna Demond ’11 for UMBC.